Incredible sound quality with a maximum distance of about 35' feet. Single speaker base is approximately 3" X 3" tall. Uses proprietary Air-Bass pneumatic pressure boost technology. Significantly reduces distortion. Suitable for any type of music. 3W Music Output Power Built on 3.7v 600mAh lithium battery Capacity. Charging Voltage at 5V, Charging Time at 3.5Hours, Last time around 4 Hours, MP3 TF card player supported, Card Reader Function Supported, Auxiliary input supported, Works on Microsoft windows and Mac OS Operating system. Incredible sound quality with a maximum distance of about 35' feet. Single speaker base is approximately 3" X 3" and 3 1/2" tall. Uses proprietary Air-Bass pneumatic pressure boost technology. Significantly reduces distortion. Suitable for any type of music. 3W Music Output Power Built on 3.7v 600mAh lithium battery Capacity. Charging Voltage at 5V, Charging Time at 3.5Hours, Last time around 4 Hours, MP3 TF card player supported, Card Reader Function Supported, Auxiliary input supported, Works on Microsoft windows and Mac OS Operating system. The Across BS2038-S018 is one of the most amazing speaker you will ever see delivering amazing music straight to your ears. True wireless play via built in bluetooth technology you can take advantage of this speakers amazing portability and sound without the wires. It's small and convenient size gives you ultimate portability without the wires! Imagine yourself on the beach having your phone safely hidden away while your speaker is blasting for you to jam with superior music. Pairing with Bluetooth test devices proved to be a smooth process and the speaker will remember your device after the initial pairing, Use your computer*, tablet or smartphone to control your music and stream audio wirelessly. you’ll enjoy wireless freedom and simplicity. 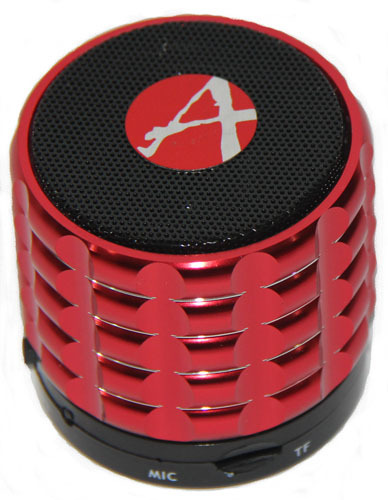 The Power button, Bluetooth® pairing button and 3.5 mm auxiliary input are hidden discreetly in side of the speaker. They’re easy to access when you need them and invisible when you don’t.